AFRISAM PLAYS A ROLE IN UPLIFTING YOUNG SPORTSMEN AND WOMEN. As a leading construction materials supplier, AfriSam’s overall Corporate Social Responsibility (CSR) mission is to understand the needs of communities in areas where it does business in order to make meaningful and sustainable contributions to their upliftment and longterm development. AfriSam’s intensive CSR programme places particular emphasis on education and youth development, which is exemplified by a number of educational projects nationwide, which aimed to empower and equip communities with vital knowledge and skills, as well as provide them with the tools and facilities to become self-reliant and sustainable. As an extension of its commitment to community and youth upliftment and development AfriSam recently undertook two CSI sports-based initiatives in communities with which it has had the good pleasure of fostering close and productive relationships, in the hopes that its ties in these communities may be further enhanced. 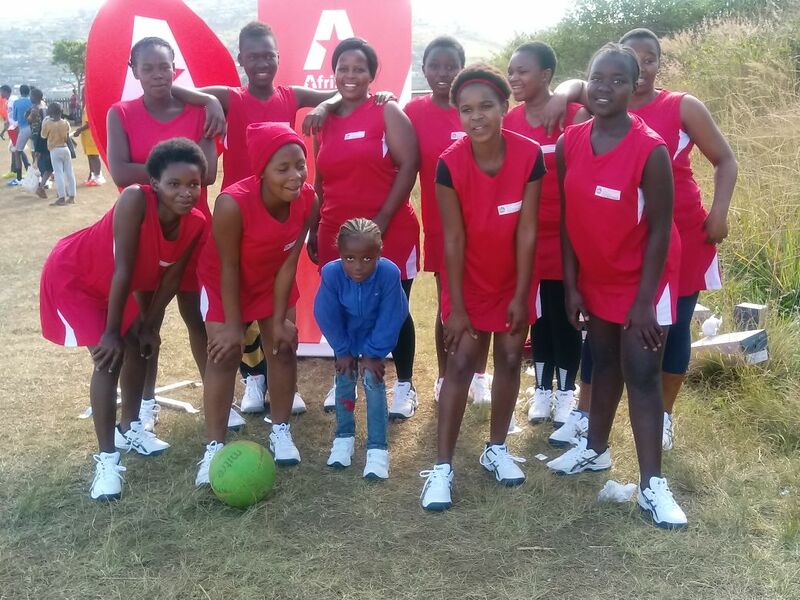 AfriSam’s Pietermaritzburg aggregate operation has built strong relations with its neighbouring communities and made a difference on Youth Day 2018 by donating soccer boots and netball shoes to King Smanga Stars, who are among the underprivileged youth of the Copsville Community. “This initiative is significant to AfriSam because we understand the importance of developing our youth and the role that sports can play in this regard. We hope that with this donation, these children will be adequately dressed to inspire great performance on the sport field and in class”, says ESD professional at AfriSam’s Pietermartizburg aggregate operation, Senzi Mabaso. King Smanga Stars was formed in 2017 by Thabiso Zulu with only 12 members. To date, they have grown to over 70 members who will be receiving the much needed sporting apparel from AfriSam. The young boys of Smanga Kings Stars have defied all odds and formed a very successful soccer team which has reached more than 11 finals in different tournaments. The soccer and netball teams are a great way to engage youth in positive activities in the local community. “AfriSam’s generous contribution means a lot to our players. It will elevate the team to a higher level and empower these young people to focus on sports and the opportunities that can be created for them by excelling. We will finally be a complete team with soccer jerseys and boots”, says Thabiso Zulu, founder and manager of King Smanga Stars. “We are very proud of our children and we thank AfriSam for restoring hope in our team”, added Zulu. In addition to this initiative AfriSam proudly supported Build it Vlakfontein, in the West Rand of Johannesburg, on the 7th of July in their staging of a soccer tournament for the under 13 teams from surrounding communities. This event was particularly significant as it took place during Mandela Month, a period during which the world celebrates the late great statesman and the values he stood for. As a key supplier to Build it Vlakfontein, AfriSam saw the need to support its partner on this soccer tournament and gladly jumped in to make this day a success. This soccer tournament speaks to its “Creating Concrete Possibilities” mantra and enables it to contribute to the empowerment of the soccer enthusiasts in this community. “For us, this soccer initiative makes us realise what we can achieve if we work together. These are the communities that support our business and this is our way of thanking them,” said Marco Gomes, owner of Build it Vlakfontein. “My team and I are immensely proud of these young boys and the passion with which they approach the game. We have future stars on our hands,” continues Marco. With 18 teams competing and over 400 supporters, the event was an overwhelming success. It was heart-warming to witness the passion and emotional investment made by all involved. It was also exciting to see talent in action and the potential that could come out of such initiatives. While team Brazilian walked away with the trophy for the day and VT FC was the runner up, the rest of the teams gave them a good run for their money and made for an exhilarating tournament. Working together, team Build it and team AfriSam were able to serve lunch to the over 700 players and supporters as they refuelled in preparation for the after lunch matches. Up for lunch was a hotdog, an accompanying soft drink and a snack. AfriSam is incredibly proud of its CSR mission, and is committed to ensuring continued dedication to its goals of upliftment and empowerment within communities which would benefit from it the most.